After leaving our camp at Merna Mora Station we made our way into the Flinders Ranges National Park, VKFF-176, via the iconic Brachina Gorge. It was a great introduction for those who have not visited this Park before. The sun was shining, the colours were rich and deep, and two rock wallabies were sunning themselves and were apparently happy to have their photos taken many times. We made our way to the Aroona Ruins and set up our stations there. This was one part of the park I had not activated previously. All was quiet until a vehicle arrived with a particular brand of refrigerator (I will not mention the name here) but luckily he was a fly-in-fly-out type. It was time to pack up and look for a lunch stop. We soon found a site near a creek and stopped for lunch and relaxation. It was time to move on to Wilpena Pound for fuel and a look at the facilities. Paul was happy to set up straight away and work his 44. It was not quite as urgent for me as I had 33 contacts already from this Park. I set up where I previously activated the Park at Wilpena: just off the overflow car park. 7.105 VK5PAS/P5 Paul at Wilpena Pound and within sight. He was loud! 7.095 VK4FFAB/P4, Rob in VKFF-109. What a great way to finish the session with a Park to Park contact. Thanks Rob, you made my total 32 contacts from this Park and a grand total of 55 contacts more than qualifying the Park with the required 44. Many thanks to all who gave me a call. 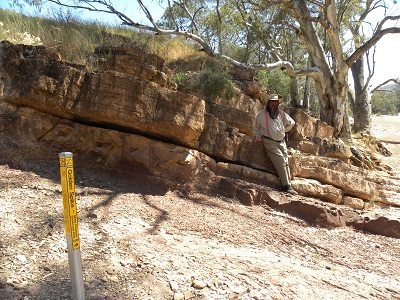 Here is a link to my 2013 activations at Flinders Ranges National Park. If you ever get a chance to visit this great park in the beautiful Flinders Ranges you should jump at the chance! You might be interested to know that the picture at the introduction to my blog is taken from the summit of Mount Ohlssen Bagge. The plaque on the right hand side of the picture (not clear to readers) states the name of the mountain and gives the height as 923 metres. My wife and I climbed Mt Ohlssen Bagge in September 2011 and had a great day out. I should say that Mount Ohlssen Bagge does not meet the SOTA criteria, but it is still a great climb and we love this part of the world! My first activation was on 24th September 2013. I picked a creek bed almost at Sacred Canyon. At 06:10 I called on 7.100 and VK5LY/p answered my call. Larry was activating Cooltong Conservation Park. Then came VK5WG, Nev; VK5PET, Peter; VK5KGP, Graham; VK5PAS, Paul; VK3ANL, Nick; VK5HS/m, Ivan near Adelaide Airport; VK2BNN/p5, Brett at Rawnsley Park; VK5HCF, Col; VK3AMB, Bernard and VK5FCTC, John. As it turned out Brett was staying at Rawnsley Park and later that evening I arranged to meet Brett with the help of 146.500Mhz. Brett told me he was planning to activate Saint Mary Peak as his very first SOTA activation. I am waiting to hear whether he was successful or not? I enjoyed contacts with: VK5KC, David; VK5LY, Larry; VK5PAS, Paul; VK3GT/p5, George camping in Parachilna Gorge; VK5HS, Ivan; VK5APC, Errol at the Port Adelaide Radio Club; VK5FEKH, Errol, 10 watts on his dipole; VK2IY, Angus and VK1MA/p2, Matt at VK2 ST 005. Third Activation: 26th September 2013 Wilpena (near overflow car park). I had contacts with VK5LY, Larry; VK3UBY, Col; VK5PAS, Paul; VK3LSC, Sandra at Mildura; VK3HRA, Allen; VK5HCF, Col; VK3ABM/2, Peter and VK3BJM/m2, Barry. Imagine my surprise when two workers stopped the utility near the park table I was using and one said, I recognise that voice! Richard, VK5UK, I knew was working at the Wilpena resort and it was great to catch up with him. I was a bit sorry he had to get back to work! 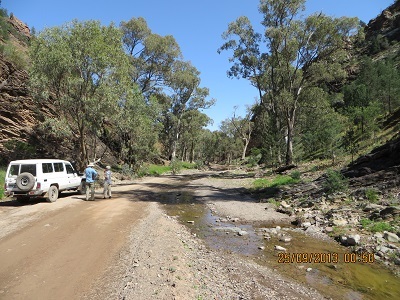 My fourth activation of the Flinders Ranges National Park occurred from the Trezona Camp Ground. I had contacts with VK5PAS, Paul; VK5LY, Larry; VK5HS, Ivan; VK5CZ, Ian and VK5HCF, Col, making a total of 33 contacts over the four activations. On Friday 27th at the Wilpena Visitors’ Centre I saw Brett, VK2BNN, for a second time. I congratulated him on activating St Mary Peak and wished him well as he set out with his family for further adventures. 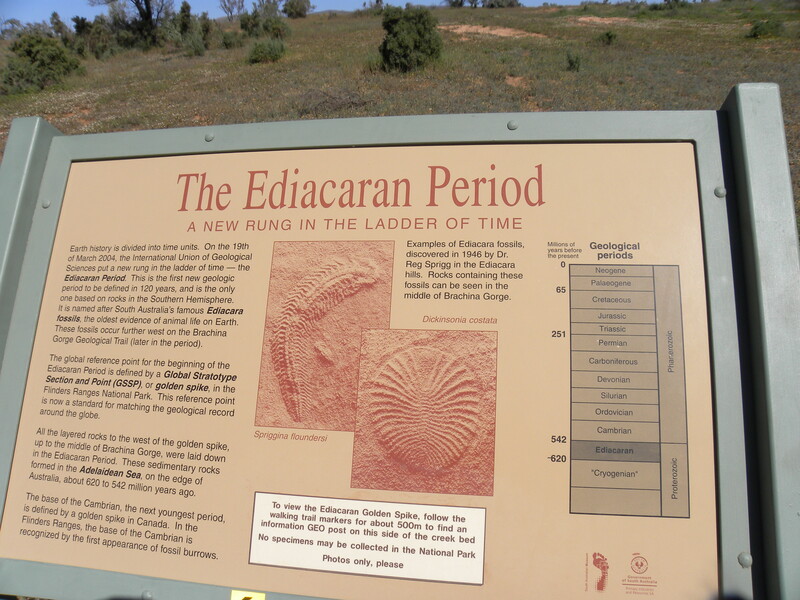 The Flinders Ranges area is known for its geological features which shed further light on the history of our planet. While at Trezona campground we set out to find the Golden Spike. 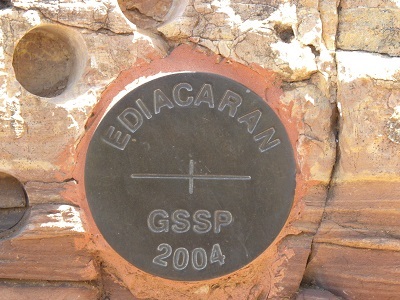 This monument celebrates the Ediacaran period in geological time and a small plaque is embedded in rock in the creek bed to signify the importance of this area.